A few years ago, I attended one of my former high school student’s baccalaureate graduations. Also in attendance was her mom, a single mother of three young adults. She had literally arrived just in time for this commencement, which was 706 miles away from home. She donned a black, sequenced matching shirt and pants. Her luggage was in tow. This scene was typical; she wore her challenges. As Langston Hughes might say, life for her ain’t been no crystal stair. But still. No matter the situation, this lady was always there for her daughter and her other two adult children. She might be the loudest one in the crowd, but that was because she was supportive. She might have snuck some popcorn into so-called prestigious events, but that’s cause everybody knows that concessions at large events cost too much. I watched her quite a bit that weekend. She snapped 27 pictures on her disposable camera. Tossed the throwaway in her bag and snatched a new one. She did this four more times. I watched her “save” the graduation chicken because essentially, nobody else there really knew how to grill it. And I noticed how she loved her children, the best way she knew how, given her experiences. By Sunday, Mother’s Day 2013, something dawned on me; this mother is no different than I am, a mother of two daughters, or any mother for that matter. So I posted this: The longer I am a mother, the more I understand that each mother just does the best she can, given her circumstances. Then, something else happened. I thought about my own experiences as a daughter. Many times I felt embarrassed because my mother carried a terminal illness that would lead to death, kidney disease. A lot of times, I wished my mom were someone else. So much so that she had offered to take me to see Michael Jackson’s Victory Tour, but I declined. As much as I loved MJ, I didn’t want to be asked if this was my grandmother, again. It wasn’t until years after my mother’s death that I realized how much of a gem she really was. In between dialysis treatments, she led a fearless life. 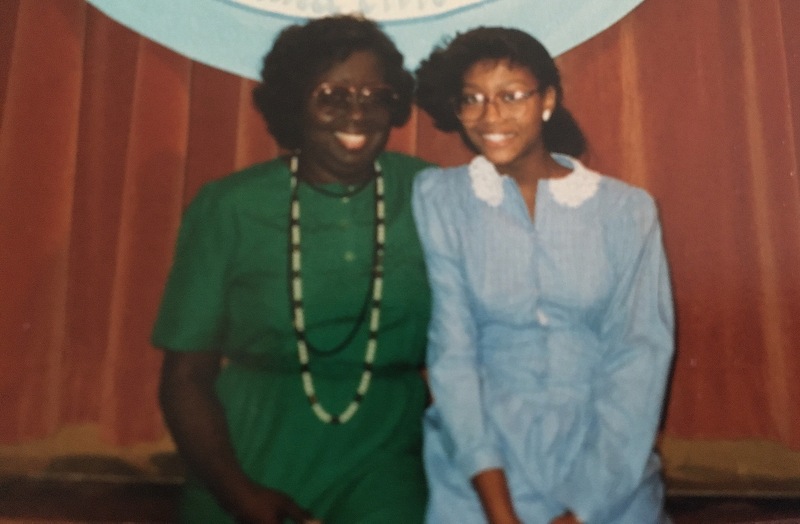 She was deeply involved with NAPHT (National Association of Patients on Hemodialysis and Transplantation), volunteered as a Sunday school teacher, worked part-time, supported anyone she called family and friend, and all the while actively chose to raise me, this daughter she had adopted. My mother had ensured that I attend the best public magnet K-12 Chicago schools, which provided me with rich childhood experiences. In fact, I attribute my spirit of service, advocacy and motivation in part to observing my own mother do the very same things. So while there were moments of adolescent shame due to my mother’s physical appearance, there’s now an adult appreciation because I recognize and honor her for doing the best that she could, given her circumstances. Now, I’m the mother of two fairly quiet teenage daughters, who would rather I remain silent than speak out about small infractions. These daughters turn a side-eye with every picture I capture and every post that “tells their business.” My oldest claims that she won’t tell me anything because I’ll tell everyone (guess this blog partially proves that). My youngest daughter would rather become invisible than to watch me dance in public. I’m often met with a lot of, “Are you wearing those shoes with that?” when leaving the house. But I hope that one day they’ll understand that it matters less if my shoes match my shirt. I hope that they’ll understand the reason their mother took a 320-mile commute every now and then for a career she felt called to do. I hope that they’ll remember family trips, game nights, healthy food, and movie dates. And when they’re feeling as if I could have done more, I hope they’ll remember that I too, did the best that I could, given my own circumstances. Amen! You expressed what so many of us feel so well! Beautiful! I echo all the lovely thoughts of others. I enjoyed reading this. Thanks so much for your read and comment. I totally agree about how it puts us on common ground, and once you become one, you become so very enlightened. Awe this is so sweet, what a lovely tribute to your mom. I hope you had a nice Mother’s Day Kathy!! Thanks! I definitely did. And happy belated to you! For most, Mother’s Day has come and gone. I, on the other hand, am still celebrating our moms throughout the month of May by sharing their stories with the world. If you’d like to salute your mom and share a story of lessons learned, drop me a line here. Today I’d like to salute Katherin’s mom. Katherin is a mother, educator, and blogger. She blogs at KE Garland: Inspirational kwotes, stories and images. Check out her site, but while you’re here, take a little time to read about her lessons learned. Happy Mothers’ May! What a touching Mothers Day tribute – so real! When young, we can find so many reasons to be exasperated by our mothers but then, I think, if we are fortunate, we look around one day and realize many of those same “reasons” carry the indelible hallmarks of their unique personhood, and stamp of their care on our lives. Thanks for helping me to reflect on that. You’re welcome and thanks for these words Leslie! You’ve captured exactly what I was trying to convey. As we age, we start to realize some of the sacrifices our moms made. I used to be ashamed that my mom didn’t make it to many of my events — not realizing that working full-time and raising three of my first cousins had probably depleted her energy and desire to do one more thing — even for me. Thanks for this comment Michelle. That’s exactly my point, no matter the size of our struggles with our moms, at some point we have to realize that they all were just living life based on their backgrounds and current situations. Katherin, do you mind if I reblog this article as part of my Mothers’ May project? That’s perfectly fine Michelle. Thanks! Beautifully written, love the sentiment. All parents do the best they can and face differing challenges. So although your adoptive mother was older and sick she still did her best. Your mum had a beautiful smile! Sounds like you really did taken on those admirable qualities of hers. I’m sure when your daughters get over the self obsession of teenagedom, they’ll see that they have a really great mum and role model. Happy mothers day! A wonderful tribute to mothers everywhere. One of my regrets is that I didn’t give my mother all the attention she deserved,,and one of my lessons is that I cannot expect my own daughters to give more than “given their circumstances” Thank you. Thanks so much. I hope she knows how much you loved her, and I hope the same for you and your daughters. Great writing! I agree, lets pause before we judge other mothers. Thanks a bunch! Happy Mother’s Day to you! By the way, you once mentioned blogging as a way to “hone” your writing. I would love to hear more about that. Could you maybe write a post on that topic one of these days? I loved your intriguing headline. You are right. We shouldn’t judge. I finally realized last year the true struggles my mother faced. She has three kids under four before she was 23. I finally got it last year. She did her best. I wish you could see me nodding my head. That’s exactly it. We all are. No matter our circumstance; we’re all just doing it. And I really hope that we can begin to cheer one another along just a little more. Thanks for the read! So well put! I’ve often remembered the times I was embarrassed of my mom when I was young. Since her passing, I’ve come to appreciate even more what she did for me. Wonderful writing! As a mother and a daughter I can relate to being ashamed of my younger self. How rude I have been to her… You should add a link to your previous post on Graduations, it’s connected right? I get it, Dr. Garland. I’m right there with you. 🙂 I guess we are both musing on Mother’s Day. I haven’t let mine out yet–still hovering over the “publish” button.